I am NOT an Opthalmologist. I am NOT a Veterinarian. I am just a curious individual (that many years ago enjoyed studying neuro and biopsychology) with 17 years experience watching dogs training and competing in Agility. My goal with this topic is to compare how dogs see the world vs how the we see things, and to relate them to the sport of Agility. I hope that this information may influence choices made designing/choosing equipment for this sport. EYE STRUCTURE: Human eyes have more CONES. Dog eyes have more RODS. Cone cells distinguish Colour. Rod cells require much less light/illumination to detect the Grey spectrum. In twilight or indoor semi-darkness a dog can see more clearly than we can. They can see in light 4X dimmer than us and only need 1/4 of the light we do to see at night. Rods are also sensitive to MOTION, allowing dogs to detect smaller movements and to quickly sense something new that is moving. ie Prey... helpful when hunting at night/dusk. The central Retina area of a dog's eye is 20% cones vs 100% cones in a human eye. The cones work best in mid to high levels of light. Dogs derived from wolves. Wolves are nocturnal and rely more on the ability to see in the dark vs discriminating between colours to see food. It is only since their domestication that tame dogs have become Diurnal (active during the day). EYE PLACEMENT: A Dog's eyes are set on the front of the face not the sides like a horse, so a dog has good Binocular vision. Binocular vision allows BOTH eyes to simultaneously see an object. But, depending on the distance of that object, a dog may see a blurry outline rather than a discernible object because their ability to focus on detail is not as sharp as ours. FIELD OF VIEW: Field of View is the area that can be seen when the eye fixes on one point. A dog's Field of View is up to 270 degrees compared to a Human's at 180 degrees. Although the Human has less Field of view they have larger vision overlap and that produces better depth perception. Field of View varies by breed due to placement of the eyes in the skull. Length of nose also interferes with the amount of binocular overlap. PUPIL SIZE: Dogs have larger pupils than humans, allowing more light for night vision. They see objects only in the centre of the image to be in focus when looking over long distances. Everything else in the image appears fuzzy. Ironically, while dogs are not able to see in as fine detail as we are, they see things over greater distances than we do IF the object is moving. Dogs see flickering light better than we do. The human brain does not detect the flicker of motion pictures/TV, but a dog is more sensitive to detect those individual frames thus flickering effect. DEPTH PERCEPTION: Depth perception is enhanced in those regions in which the visual fields of the two eyes overlap. This will vary among breeds due to lateral placement of the eyes in the skull. The binocular overlap in people is approximately 140 degrees (with field of view at 180 degrees). In contrast, the dog with much broader Field of View (monocular fields of 270 degrees) has much narrower Binocular overlap of only 30-60 degrees. This binocular field (for depth perception) is tall, narrow and pear shaped. Depth perception is probably greatest when the dogs look straight ahead and is probably blocked by the nose in most breeds when dogs look below the horizontal. Author's Note: (Perhaps dogs jumping heights taller than their shoulder will experience this to a greater degree - ie a 20.5" dog has eye placement at 23-24" so looking below the horizon to sight the bar at 20-22" may be difficult with a longer nose blocking that viewing area? Will setting a strong colour such as blue/black horizontal bar against clear vertical lines (wings with posts) may assist in spotting the bar for these dogs? VISUAL ACUITY: This is the ability to resolve shapes over a distance (important in Agility!). Canine vision is estimated to be 20/75. To see what this means if you have 20/20 vision corrected vision or blessed with it naturally, look at an object (ie a jump) 20' away from you (a typical distance on course). Notice the detail, the colours. Now move that jump 75' away from you. Can you take in the detail and colour from that distance? So what we see at 75' away is how the dog sees it just 20' away! That is assuming their acuity (sharpness of focus) is on par with our 20/20 (which it is not)... At long distances, dogs rely much more on their higher audio detection capabilities and movement detection. They will not detect camouflaged animals/objects as well as Humans due to our higher colour range. Try playing Hide and Seek outside with your dog wearing Blue or Black vs Yellow/Orange/Red. Modern studies of refractive states in dogs have suggested that most dogs are within 0.5 D of emmetropia. : the normal refractive condition of the eye in which with accommodation relaxed parallel rays of light are all brought accurately to a focus upon the retina. SUMMARY: Compared with the visual system in people, a dog's visual system could be considered inferior in such aspects as degree of binocular overlap, colour perception and visual acuity (depth perception/colour recognition/crisp focus) However, in other aspects such as ability to function in dim light, field of view ability to differentiate shades of grey and perhaps ability to detect motion, the canine visual system surpasses human making the dog a more proficient predator. Agility takes advantage of heightened motion sensitivity spotting a moving Handler, but all of the equipment is still. Lighting is often brighter vs dimmer, so that heightened ability is not being used to advantage either. HOW DOES THIS RELATE TO AGILITY? SURFACE: Agility takes place most often on Brown Dirt, Brown Sand, White Silica Sand with white fibre, Green Grass, Dead Grass, Artificial Turf (Green) Blue Matting, Black Matting. The Dirt/Sand/Grass - alive or dead/Artificial Turf all appear as tones of Yellow hues. The Blue flooring appears Blue and the Black Flooring appears Black. Dog's would see the greens and Red as yellow tones. The white is the same and the blue is a lighter tone of blue. The dogs see a much greater degree of lightness/yellow in the mix. Silica Sand/Fibre White walls - The black really stands out. Less contrast needed on the bars - Solid black bars may provide more information. The vertical lines of black frame the horizontal line/bar well. Indoors: White walls, brown dirt. Dog's Eye View of dirt is Yellow. The red contacts appear solid yellow. The Yellow contact zone at the end of the teeter disappears under the lights with a white wall in the distance. The red markings on the bars blend in with the footing. The judge is very visible wearing darker colours. CONTACTS: AFRAME/DOGWALK/TEETER -All three pieces of Contact equipment have contrasting colours. In Agility in Canada, the contact zones are Yellow. As seen in the photos above, much of a dog's world is viewed in tones of Yellow, including the surface. Yellow on Yellow is the opposite of contrasting. It is continuous. Yellow IS contrasting to Blue or Black. The dog does not need to see Yellow on the equipment to help it discriminate from Dirt/Sand/Grass/Turf. The judge needs to identify the zone to make a call. It might be easier for the dogs to have the entire board be Blue or Black so they CAN distinguish more easily/quickly where the ground is if on the piece, or where the board begins if on the ground. This would be of more value to those dogs with less visual acuity. For Judging purposes, a line drawn at the top of the contact zone area and extended onto the sides of the ramp would work to see if a foot is in/out/over the contact zone. I also wonder with running contacts and visual acuity, if cleaner delineation of ground (yellow tones) vs equipment (blue or black) would encourage deeper reach? 2020 may be easier with sharper contrast between blue or black boards and yellowish footing. I put a black cover over the Yellow which shows a significant improvement in contrast against surface. Making the Aframe Black sets if off from the surface (if the entire ramp was black) and the blue bar. The Pink gets lost / blends with the surface. This could be very difficult. TUNNELS: Bright Yellow Tunnels with Black ribbing, Lighter Blue tunnels with Black or Yellow Ribbing, brighter purple with Black Ribbing appear visually obvious. Darker Blue are easily seen but not safe to perform in low light conditions/bends in the tunnel. This is perhaps due to the sudden change from high levels of light to darkness at speed, before the rods can adapt? My tunnels all have Yellow Ribbing which blends in with the footing too much and is not as obvious as black would be to define the shape of the Tunnel. Sky Blue tunnel/yellow ribbing with Red Tunnel Bags/Green bags and white bags. Dog's vision sees it as a more grey blue. The Red and Green bags look yellowish and the white bag remains white. The yellow rings would be better seen in black. Purple is Grey tone and bags remain blue/yellow. TIRE: The tire obstacle also has to factor in the frame holding it.. Tires come in Flat faced foam and 3 Dimensional (Round ducting material). The tires are banded in colour to assist the dogs (hopefully!) to navigate thru the centre. There are several issues with tires: 1. Shape - Depending on colours used, the flat faced tire can be harder to spot than the 3 Dimensional tire. I have judged MANY trials over the years and seen thousands of tire performances. Many dogs take off early on this obstacle which signifies they are struggling to locate what to jump and where it is. The jumping arc should be centred over the jump/bar. Considering the information above re: colours, designing tires using Red/Yellow on footings of Sand/Grass/Turf/Dirt is providing very little information for the dog to pick a take off spot. Last summer I took a photograph of a red/yellow painted flat faced tire. In dog vision the yellow blended with the grass and the red appeared greyish like hovering shadows between "floating" pieces of yellow. It was quite difficult to discern what it was and it did not look like a tire to jump thru. Compounding this puzzle is the frame holding the tire. If it is a style with protruding legs the dog needs to find the tire BEHIND the legs (which are at the dog's eye level) to pick a take off spot. You can teach a dog to ignore the tire frame but that is of little use if it only pops up in a trial situation and never in training. This is the same red frame above. The tire is flat foam painted Red and Yellow. This is a sharply focussed image for colour comparison. It does not represent the acuity of a dog looking at it. Dog's view photo taken with lower acuity/focus. Red frame and red contrast on tire appear like shadows. The yellow pieces appear to be hovering. The horizontal line thru the tire is the Dogwalk in the background. some Popular colour choices for tires on the left. How they are seen by the dogs on the Right. Red/Yellow are very similar to the grass (yellow). The black and blue are easily seen. Black with Blue, or Black with Purple would combine well visually. The black and white, and solid black would be the easiest visually for the dogs. Here is a comparison of a red striped tire top half/blue striped bottom half in a red metal frame with forward 45 degree legs. vs Blue striping all the way around the tire without a tire frame. After removing the tire from the frame, I taped the top half blue over the red and hung it from a tree branch. I set up a jump grid of equal distances I ran a few days prior: 15', 17' 19' spacing at 20". I wanted to see if she would arc closer to the tire without the frame present, because it appeared the frame was dominant over the tire in her set point choices. Next, I put the new blue wrapped tire back into the frame and compared if the set point on the blue was better than her take off spots on the red. as it appeared with new blue colour on top half/no frame to hold it. Dog's view: Red banding on top of tire blends in with red frame. The bottom half of the tire is more obvious than the top, also the white blends in with the grey sky. The white fencing pattern is adding more information to process at speed as well. Blue and Black are excellent choices on weave poles. They have great contrast agains the surface. Solid poles vs contrasting poles still needs to be tested. JUMPS: Wingless and Winged. White works but depending on surface glare, lightness of sand/dead grass, can be harder to spot. Horizontal lines are easier found in relationship to vertical ones. The wing jumps with vertical posts frame the horizontal bar beautifully. Taping accents of white jumps help greatly to outline the shape But narrow banding blurs at distance. Bar colour: Best seen is Blue, Purple or black on dirt/sand/grass/turf. Perhaps combinations of white/black/Blue with more black/blue would help them stand out the most? Dogs lower acuity means broader banding of colour contrasting will be more obvious than narrower banding. Depth of field is narrow. Dominant colour should be in the centre third and also appear to the edges of the bar. Contrast can be in 2-3" widths in 2-3 locations, but should not be prominent. The red Taping helps to outline the white wing shape. The colours on the jump bars do not contrast against the surface (grass). The bottom two bars pink/red are very similar to the grass. The Green chair has more contrast/depth behind the jump than the white chair. With a Roll of Black Duct Tape SIGNIFICANT IMPROVEMENT in visability of bars! There is so much background 'noise'- it makes finding a bar a more difficult task. The red stripes on the white bar coincidentally line up with the wall studs. Black jump bars with red/white narrow contrasts shown in full spectrum on Left, and Dog's Eye View on Right. Even at 60 feet, the furthest black bar is clearly visible! Orange or Green Barrier Fencing blends in with most surfaces. White fencing can make spotting jump depth more difficult. Summary of Thoughts: I think I now have more questions to answer than I did when I began looking up a few things! Some of my big 'take aways' from this research are: environmental colours can overshadow the equipment colours - footing/walls/fencing/sky, ring crew chairs will blend in better if green vs white. Ring barriers in orange or green will not create depth issues when jumping towards the fence line. Minimizing 'noise' under orange tarps (equipment not in use during the course being run) will also create more focus on the stuff that matters. 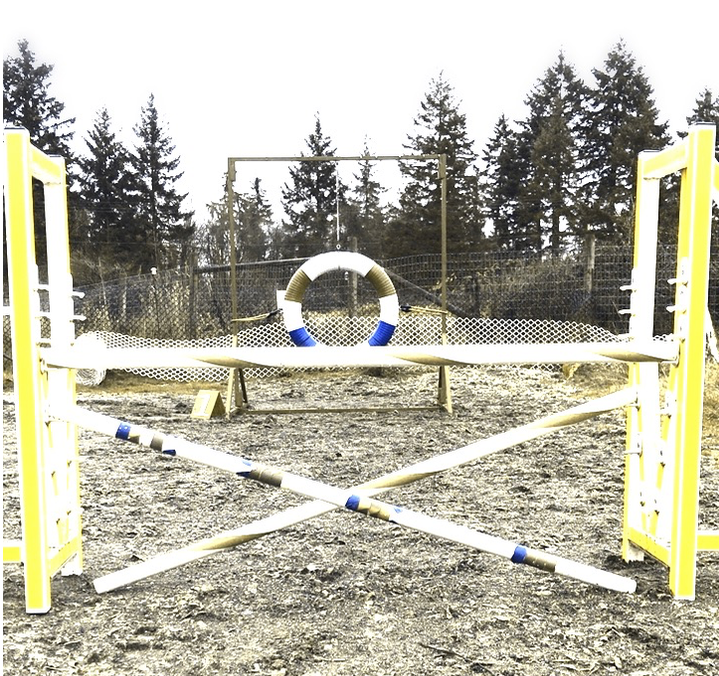 Emphasizing the bars TO jump with blues and blacks (and the crossbars with Red/Orange/pink/green will help the dog focus on the important piece of the obstacle. Contrast between the ground and the contact ramps is VERY important, more so than contrasting the board itself with a contact zone. For dogs with acuity deficiencies greater than the 'average dog' (and they ALL have less acuity than people do, contrasts of black/blues or bright, darker purples would set depth for mounting or dismounting the contacts from the ground colour - 2020 or Running Contacts would both benefit with crisp delineation of board/ground. For Judging purposes, only a line is required across the ramp wrapping the sides of the ramp. The big jumps, including the tire need to be clearly seen. I'd like to see the colour pattern on jump bars be different for single jumps vs the bigger jumps. ie black/white markings for regular jumps and blue/white for tire, double, spread, triple. The dominant colour needs to be substantial - approx 75% of bar length. 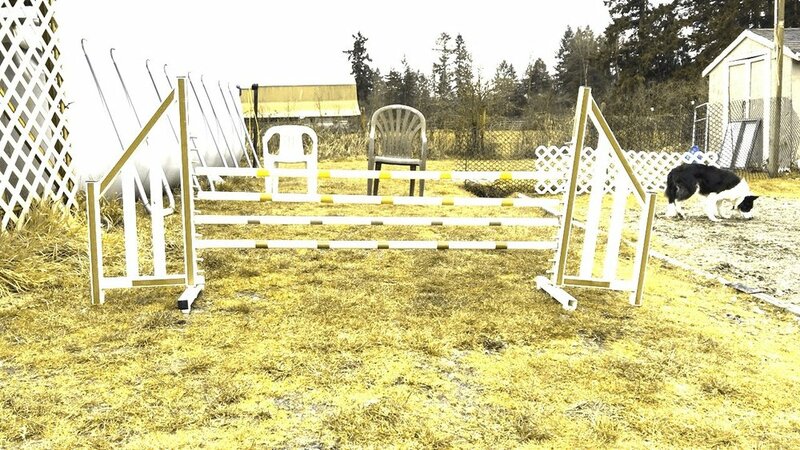 It would be amazing if that became standardized so in all agility rings the dogs would know by bar colour what they were approaching. The tire should be addressed in the same manner. The entire inside diameter should be a dominant colour, such as blue, black or dark purple. Small amounts of effective contrast can be added. The tire MUST be more prominent over its frame. Tire Frames that are "T Style" will draw less on the dog's focus vs 45 degree angled supports. Strong coloured Tires can really assist the dog navigating the tire's location from the frame holding it. The Tire Frame colour should blend with the environment and not compete for the dog's attention. ie red/orange/green/pink on grass/dirt or sand. A strong colour on the tire will allow the dog to be more accurate in setting up for its take off point. If the contacts are Blue, Jump bars on singles should be black to help with the depth of the jump in front of the contact. If the contacts are black, the bars could be blue. I could not find any photos online of black contacts, tho I have come across them in videos. Black is a GREAT choice (visually) for contacts!! Red/Orange/Pink/Green disappear agains dirt/sand/grass/turf. They hold up better as shades of yellow against blue or black mats/flooring. I am going to continue to work with colour schemes and jumping. Perhaps colour can make jumping an easier task for dogs with less binocular overlap (depth perception), and less acuity (focus). Making my home environment as comfortable as possible may make it more challenging going into trial environments. It reminds me of the introduction of rubber over sand/paint on the contacts: training on rubber at home but trialling on sand was challenging/surprising for the dogs trying to decelerate (if stopped contacts). Now all venues in Canada use Rubber so there is consistency. Perhaps in the future, colours on trial fields will become standardized too :) Dream Big! In the mean time, I will expose my dogs to the typical colours seen in our trials, but I will train more frequently with more black and blue on our jumps/tires/weaves. I hope this information will help you choose agility equipment with your dog's eye view in mind. Please share with friends, coaches, Trial Hosts and your equipment suppliers. PART 2 - COLOURED BARS JUMP STUDY NOW AVAILABLE! Click on the Jump Bars to Join the FB group Dog's Eye View! Join the FB group Dog's Eye View to see equipment transformations from Puzzling to Perfectly clear! Click on the Jump bars above.